As 21WIRE reported last year, the White House’s new candidate for US Attorney General has a dubious record when it comes to ‘terrorism cases’. Our question: is she what the US needs now, or would she fit in better in a police state regime like China or Egypt? As US Senate confirmation hearings resume Monday, President Barack Obama will be hoping to finally off-load some dead weight in AG Eric Holder, replacing him a new appointee to run the Department of Justice (DOJ). 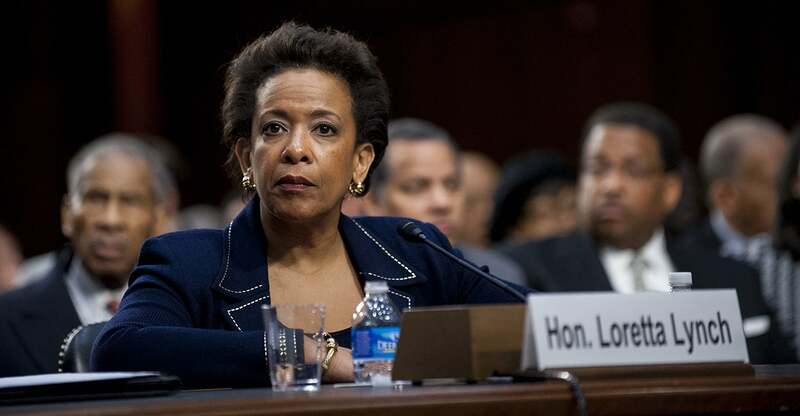 What Lynch (photo above) has willfully turned a blind eye to in this story is astonishing. Her recent statements in a high-profile terrorism case indicates that she’s on board with some of the worst federal practices America is suffering today; no due process, and state-sanctioned torture used to obtain bogus statements from numerous synthetic terrorists. In the case of Somalian born British citizen Mahdi Hashi, court documents reveal how authorities first pressured him to become an informant, before detaining him in Djibouti, Africa, and without having been informed of any of his rights. Then, they began threatening him with sexual abuse and using forceful methods in order to extract various statements and ‘confessions’ under physical and psychological duress. Finally, having stripped him of his citizenship, and – being “rendered” to New York in 2012, he was held in secret for five weeks. He’s been in solitary confinement ever since. Jury selection for Hashi’s trial is set to begin in February. Critics believe that Hashi’s upcoming trial is just the latest in a long line of War on Terror ‘show trials’ off-shored to the US, including those of known British intelligence informants, Abu Hamza and Haroon Rashid Aswat. For Lynch to insinuate that Hashi’s statements under duress were “voluntary”, shows just how dangerous she could be as Obama’s chief law enforcement official in the US. Lynch’s rubber stamping of enhanced interrogation techniques (EIT)-induced statements and confessions has been pivotal in helping move Hashi’s conviction down the line, all the while appearing to overlook the obvious litany of human rights abuses – by a system that has dug itself into a hole, and now wants to see the problem go away by locking up Hashi for life in a US federal facility. According to the case transcripts, Hashi (photo, left) was first taken to a secret government facility located in Djibouti City, and initially ‘worked-over’ for weeks on end by a group of both Djiboutians and Americans, whom Hashi stated were representatives from Joint Special Operations Command (JSOC), or the CIA. During this period, Hashi was also forced to witness the physical abuse of other inmates, including his co-defendant Ali Yasin Ahmed, being hung, “upside down from his ankles. He was gagged, blindfolded and beaten”. This was meant to be an incentive for Hashi to cooperate, while Hashi himself was interrogated in his underwear, and threatened with violent physical and sexual abuse if he did not comply and cooperate, all while Ahmed and others were being “raped and beaten” in the other room. Keen to extract a confession from Hashi before risking having to let him go, on September 15, 2012, the US federal government secretly ordered a team of FBI agents to fly to Africa in order to interrogate Hashi in his Djibouti prison cell. For a period spanning approximately one week, Hashi was interrogated using a number of methods deemed to be illegal under international law, before agents extracted his self-incriminating statement which the US government still considers ‘legitimate’ evidence in its latest ‘terror trial’. US government witnesses are being called from abroad to give evidence on Hashi’s ‘EIT’ interrogation sessions. “Djiboutian officers warned him that Americans “tortured uncooperative prisoners who refused to answer questions” and “strongly encouraged” him to cooperate. The ‘Americans’ interrogated him more than ten times in eleven days. Hashi was not advised of his rights, namely his right to remain silent or his right to speak to a lawyer, which according to his attorneys was a violation and an “illegal interrogation”. How Judge Lynch could overlook how Hashi is a victim in this case is difficult to comprehend. How and why did Mahdi Hashi ended up on an international ‘terror watch list” and probably on Washington’s TIDE database? It’s no secret: in 2009, then as a 19 year old care worker living in Camden, London, Hashi went public in the UK national press about how British Intelligence MI5 had pressured and ‘blackmailed’ him, along with other Somalian youths, into joining the agency to work as “informants” and to help conduct what can only be described as spying overseas and at home. Not long after this story broke, he then traveled to Somalia to help care for his sick grandmother. During this time, the British Home Secretary informed Hashi that his British citizenship was being revoked. There being no embassy in Somalia, Hashi made his way to the British Embassy in Djibouti City to appeal the ruling. He was detained, interrogated and later rendered by US officials. While incarcerated, his appeal expired, thus making Hashi “stateless” – a man without a country. Disappointingly, Loretta Lynch has drawn the audacious conclusion that Hashi’s statements ‘were made voluntarily’ and therefore admissible in an US court of law. By extension, it’s safe to conclude that Lynch supports any statements made under duress, intimidation, torture or with ‘EIT’ enhance interrogation techniques – as legitimate as any other admissions made under normal lawful circumstances. It’s worth noting also that the CIA’s program of “enhanced interrogation techniques” was banned years before Mahdi Hashi was first detained. Question: Will Lynch continue to let innocent Guantánamo detainees like the British prisoner Shaker Aamer, waste away in Cuba? Lynch’s role in the Hashi case may shock human rights and anti-torture campaigners. Will she be a “Yes” woman in much the same vein as her predecessor Eric Holder is? Certainly, Holder was willing and able to do the bidding of the establishment by covering-up abuses of power. AG Holder’s unconstitutional abuses, numerous scandals and DOJ racketeering exploits are already legendary – Fast and Furious gun-running to drug cartels in Mexico, raiding the offices of the Associated Press, and the IRS scandal whereby the White House used the taxman to target its political rivals. These are only a fraction of the crimes that Holder managed to pull-off or cover-up in only 6 years as head of the DOJ. Above all else, Holder should’ve been behind bars a long time ago for his shameful role in the Oklahoma City Bombing cover-up. Perhaps Lynch’s most embarrassing terrorist conviction is the case of Quazi Mohammad Rezwanul Ahsan Nafis, a 21 year-old Bangladeshi student who was framed for “trying to blow up the Federal Reserve Bank” with a 1,000lb fake bomb prop, built and supplied by FBI agents. Quazi was first recruited and then groomed by an undercover FBI informant posing as a “al Qaeda operative”, in what appears to be a clear case of entrapment. Quazi ended-up pleady guilty to “attempting to use a weapon of mass destruction”, and was sentenced to 30 years in a federal prison. Exactly like with the Hashi case, Lynch turned a blind eye to an abuse of government power here – in an obvious case of a patsie who was set-up by a jobsworth federal agency desperate to score another “high-profile terror bust”. Viewed in the context of Senator Diane Feinstein’s Senate Intelligence Committee ‘CIA Torture Report’, it’s pretty clear that Lynch will stay with the status quo in the War on Terror, reinforcing a toxic federal justice system in which the FBI is heavily reliant on using informants and agent provocateurs to help fabricate countless fake “terror plots”. No wonder that Lynch is considered by many as a true enforcer. Her tough record on terrorist convictions, as well as her record going after financial corruption will certainly score points on both sides of the aisle – which increases her chances of being confirmed for the vacant AG position. Unlike Holder, she is actually qualified to hold the position of Attorney General, but how she reacts once sworn into office is another matter – not least of all because Holder has radically transformed his office a highly politicized hub, and a race-baiting political pulpit – rather than the law enforcement office which it’s intended to be. Even though the AG office is still compromised by past and ongoing corruption, we can still ask the question: will Loretta Lynch do her job and clean it up by prosecuting Lois Lerner for the IRS scandal, Janet Napolitano for Operation Fast and Furious, or Eric Holder himself (take your pick of Holder scandals)? Even just one of them? Now, that would be something. This report was compiled by 21WIRE contributors and Senior Researcher Peter Sterry.